Our lcd telly has a small bright light near the edge.... so it's time for new one . I wanted the 65" at 599 but the Mrs says it's too big. Does anyone know how this compares to the Samsung 6 series KU6400 which it would replace. FakeDR they really should be banned from labelling everything as hdr, can't want for hdr spoons. Ignoring the size difference, is this better than this Samsung - hotukdeals.com/dea…944 ? I bought this last week and am pretty pleased with it. This is 4K Ultra HD certified which a lot of telly's aren't. I have paid silly money for telly's in the past but am happy with this. The magic remote is really good, but does not come with it and needs to be bought separately. Curries do not stock them. Is this TV identical to the Richer sounds one at £399? There's a comparison there. Screen mirroring, parental mode, smartphone remote app, game mode and voice control seem to be on the 6470 and not on the 6400. Not a bad price - would still go for the TCL at £349 though! Lucky Goldstar are not great tv makers these days! https://kagoo.com/tvs/compare/lg-55uk6400-vs-lg-55uk6470There's a …https://kagoo.com/tvs/compare/lg-55uk6400-vs-lg-55uk6470There's a comparison there. Screen mirroring, parental mode, smartphone remote app, game mode and voice control seem to be on the 6470 and not on the 6400. Ordered for my dad but just realised only comes with 1 year guarantee! Richer sounds were out of stock. On the LG website, both TVs look the exact same spec except the 64750 is a Currys exclusive and the 6400 is sold at other shops such as John Lewis and Argos. So unlikely John Lewis would match Currys. Lg need to give magic remote as standard now. I'd buy this if it had one with it. Still doesn't beat linsar 55 at £300! These are cheap because they are not real 4k TVs, it uses a RGBW panel which means every 4 pixel has been replaced with a white pixel as opposed to being a full RGB spectrum. So the equivalent to this in Samsung hovers around the 7400 model. The NU8000 is much better. I bought a 55 inch Samsung 7400 and a 70 inch LG 6500. I disagree that LG aren’t as good as Samsung or Sony. The picture on the LG (even though it’s 15 inches bigger) is far superior than the Samsung. However the WebOS software is lacking, sluggish and just isn’t as sharp as the Samsung. Also they disconnect from the Wi-fi for no reason over and over again and you have to input the Wi-fi code every time. I read this a few times before I purchased the TV and didn’t think it would happen on my set, but yep it does so might send mine back. In short, great picture and sound (considering it’s in built) are great but the software just isn’t quite there. Rubbish statement. Your having a laugh with Sony! love my LG’s all 3 of them. I’ve got an LG 3D Tv. I love that. But I’d never buy an LG 4k unless it was an OLED; their basic 4K TVs are not a patch on Samsung or Sony entry level! Hence the prices too! What's the warranty on it? I’ve got an LG 3D Tv. I love that. 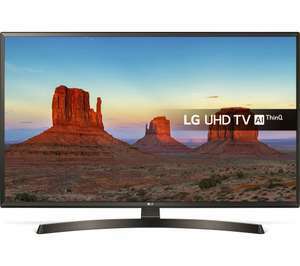 But I’d never buy an LG 4k unless it was …I’ve got an LG 3D Tv. I love that. But I’d never buy an LG 4k unless it was an OLED; their basic 4K TVs are not a patch on Samsung or Sony entry level! Hence the prices too! Both are rubbish LCD panels with some form or other nasty back light. If you want best quality save up buy an OLED. or save the money and buy this or any other maker's LCD TV, or be daft and get rubbish TV with QLED name for much more. Almost the same tech as Samsung's 'QLED',Both are rubbish LCD panels with …Almost the same tech as Samsung's 'QLED',Both are rubbish LCD panels with some form or other nasty back light. If you want best quality save up buy an OLED. or save the money and buy this or any other maker's LCD TV, or be daft and get rubbish TV with QLED name for much more. Is this true? Just about to pull the trigger on the Samsung Qled. Anyone know what apps are available? P1ss biscuits! Bought the LG 49” yesterday from Argos for £379 (just in time for Thrones!). Would have got this for the extra £20. Never mind. Great picture quality so can’t complain! How does this compare to the 6500PLA for £449 at Costco? Hi all, I looked at this last week and the picture seemed blurred at times so i bought Samsung UE55NU7400 HDR 4K Ultra HD Smart TV, 55" with TVPlus/Freesat HD, Dynamic Crystal Colour & 360 Design, Ultra HD Certified, Black From JL Who price matched it with Reliance direct for £458. QLED will be much brighter, as such it will allow HDR the chance to really show itself! The question you should be asking is, does it feel like it's worth twice the price for QLED vs this set. I just picked the cheapest QLED 55 I could see in a pinch. I've just bought the 50" 6470 which has a VA panel. HDR might as well not exist but very happy with everything else. It's been great for PC gaming, I'm playing TT-Isle of Man, and it's really nice in 4K at 60Hz . So glad it's got a free sat receiver, Sky box booted out the door. I see from the specs that the 55" has an IPS panel, is that better than the VA? No, not true at …No, not true at all.https://www.displayspecifications.com/en/comparison/246c667d4look at "peak brightness"QLED will be much brighter, as such it will allow HDR the chance to really show itself!The question you should be asking is, does it feel like it's worth twice the price for QLED vs this set.I just picked the cheapest QLED 55 I could see in a pinch. Lack of education must be so bad in parts of our country. Both this and QLED are rubbish LCDs with backlighting. Yes they get super bright, and over saturate everything. If you want max brightness, buy a bright bulb.